Municipalities are always looking for new ways to improve efficiencies and reduce operating costs. From streamlining operations to eliminating redundant departments, the bottom line has never been more important in government operations than it is today. Here are some of the reasons why municipalities are realizing the value of recycler sewer cleaning technology and making the switch. With recycler technology, there is no need to waste money on city water. 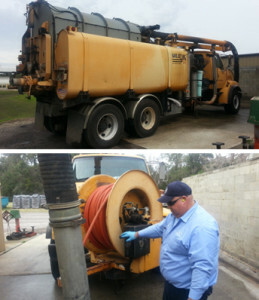 The system vacuums existing water from sewer lines and filters it for use in day-to-day operations. In fact, one truck outfitted with a Vacall Recycler continuous water recycling system can save an average of 5.7 million gallons of city water each year. With an average cost of $1.50 per 1,000 gallons of municipal water, a municipality could save nearly $10,000 a year by making the switch to recycler technology. Recycler technology can save city crews countless hours on the job, reduce overtime, and allow the completion of more work in a typical day. When there is no need to fill up on city water, there is no need for crews to stop working and drive to refill their water tank. This improves productivity and makes sure municipal crews are spending time on the work that matters. “Going green” is more than just a catchy slogan for municipalities. It means increasing efficiency and improving sustainability to lower operating costs. In addition to the obvious advantages of recycling sewer water and repurposing it for other uses, recyclers can also reduce fuel use, resulting in lower overhead and a reduction in burning fossil fuels. 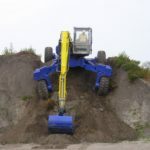 The Kaiser S2 Walking Excavators are in a class of their own. Billed as the ideal all-around machine for a variety of deployments in the toughest terrain, these workhorses can truly handle any jobsite. Whether you work on steep slopes, in riverbeds, or even on impassable marshlands, the Kaiser S2 can get you where you need to go. Because of all of these extraordinary capabilities, the Kaiser S2 walking excavators have become the go-to solution for municipalities throughout the United States. In addition to its unsurpassed maneuverability and power, the Kaiser S2 can also handle a variety of attachments to make any municipal job easy. Whether you’re looking for grapple hooks, mowing heads, ditch cleaning buckets, or a demolition hammer, the S2 has the hydraulic capabilities to effectively power whatever tool you need. Oscillating v. Vibrating Rollers: Which is Right for Your Business? When choosing a compaction machine, an important consideration is whether to purchase a vibratory or oscillating roller. Both systems have advantages and disadvantages, so it is important to understand the differences so you choose the right machine for your job. Traditional vibrating rollers are equipped with one or more weights rotating on one shaft in the center of the drum. When the mechanism rotates, the drum begins to vibrate, causing compaction forces in a downward direction to the soil. This is what typically increases the compacting force up to six times the actual static weight of the drum assembly itself, allowing for greater compaction with fewer passes. However, due to the up and down movement, the roller drum is not in contact with the ground for up to 50% of the time it is in motion. An oscillating roller is equipped with two rotating weights placed away from the center of the drum, which generates an oscillatory motion. This means that, opposed to a vibratory roller, the drum does not move its axis of rotation, but rather oscillates around it. These changes in force provide compaction energy both horizontally and vertically to the front and rear of the drum. Unlike a vibratory roller, the oscillating roller does not lift off the ground and maintains constant contact with material. Vibratory rollers have long been the workhorse of the compaction business, and have a history of providing excellent results. These machines are able to achieve uniform compaction with a wide variety of materials, and produce good depth effect. Oscillating rollers have recently started to gain more widespread use due to their benefits. These rollers provide continuous ground contact to reduce the number of passes needed compared to vibratory machines. In addition, they offer a higher degree of compaction without destroying the granular structure of the asphalt. Simply put, you cannot over compact with an oscillating roller. Finally, they produce a perfectly smooth surface, and provide optimal, dynamic compaction all the way to the joint without harming the cold road surface. If both systems offer benefits to your business, or if you can’t decide, Sakai manufacturers machines that have both options on one machine. 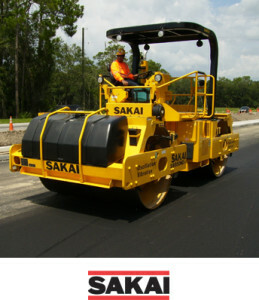 The Sakai SW850ND is one example of a machine that offers the best of both worlds, and may be the perfect solution for your business. 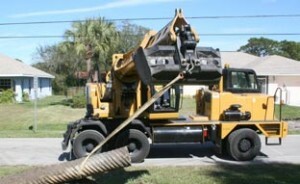 When it was time for Citrus County Road Maintenance Department to purchase new equipment, they called GS Equipment, their dealer for over 15 years. 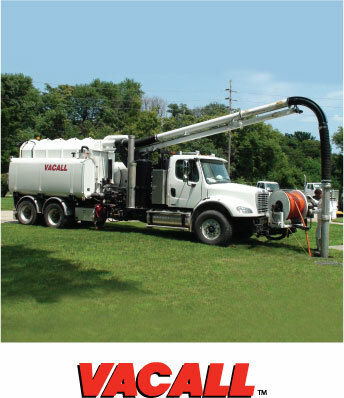 Vacall™ AllJetVac combination sewer cleaners are the perfect choice for contractors and municipalities that need to complete maintenance efficiently or open clogged sewers. The AllJetVac P Series featuring Vacall’s positive displacement blower system uses a single engine design to reduce maintenance. By relying on the chassis engine for all operations, Vacall ensures high performance, reduced fuel consumption and an easy to service engine. Vacall™ builds their debris tanks out of thicker steel and with sturdier doors than other brands. Of special value to the Florida market, the debris tank is available with a hot dipped galvanized coating to prevent rust inside and out. The galvanized tanks are so durable that Vacall includes a lifetime warranty on them. The cyclone separator and drop-out box, which are common rust failure points in many brands, are also available in galvanized coating to prevent rust and ensure long term reliability. Vacall’s baffled water tanks are built of aluminum, instead of plastic, for extra strength, so you don’t suffer from unexpected downtime. Aluminum tanks from other brands are built with thinner materials and are prone to corrosion related failure. Vacall’s water tanks are powder coated for a durable, finish that doesn’t peel and carry an industry leading lifetime warranty. The suction boom telescopes 8′ 6″ to reach difficult spots with ease. Plus, the AllSmartFlow™ intelligent control system allows either precise or quick boom movements. A dual latching system for the reel tray eliminates alignment problems and damaging stresses common in other brands. Municipalities and contractors can opt for a high dump option if their needs require, that lifts the debris tank up to 76″ and shifts it back as far as 21″. 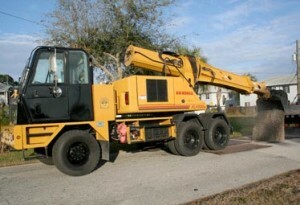 Emergency hydraulics can cradle the boom and withdraw the hose onto the reel if chassis functionality is ever an issue. Multiple blower and water pump choices are also available to help you tailor the machine to perfectly suit your needs. 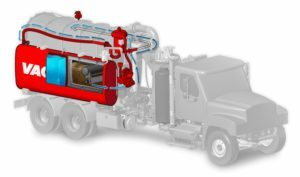 Call GS Equipment today to learn more about these powerful combination sewer cleaners and to discuss the option that would work best for you. 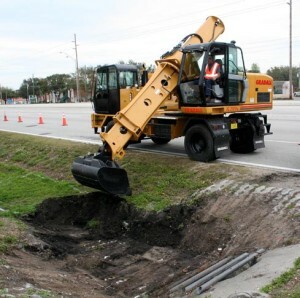 Like most cities and counties in the state of Florida, keeping storm water drainage mechanisms clear and functioning is a top priority for Casselberry, Florida. From catch basins to culverts and retention ponds, water management is a critical job for this city – a residential community on the outskirts of Orlando. 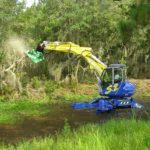 Not long after the city of Casselberry took delivery of its XL 3100 IV Gradall excavator, it was put to work clearing soil and vegetation from critical drainage culverts along Rt. 436. 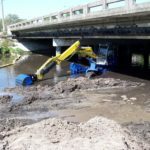 “The material that has collected in front of the drains is anywhere from one to four feet deep, collecting over several years,” said Rod Wongus, crew supervisor for the storm water division of the city’s Public Works Department. 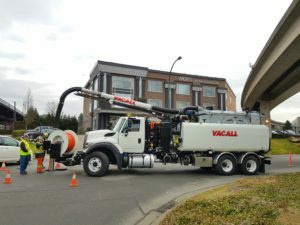 “ With the Gradall, we can clear away the entrance to about four catch basins a day, and then clean out the inside of the pipe with a hydro excavator. Without the power and boom movements of the Gradall, we’d have to do it by hand – a much slower and, obviously, labor intensive process.” With a short rear tail swing, the XL 3100 IV can be positioned and maneuvered along the edge of the six-lane highway, only blocking one lane. Operator Scott Mandigo said that not only is it easier to reposition the carrier from the upper cab, the machine is quieter, more powerful and more sensitive to movements of the joystick controls. “I really love this machine,” he said. “It’s also very good in swales.” That’s another storm water management task for the machine, according to Wongus. During the dry season – before the spring rains – the Gradall will be used to dredge about 23 miles of ditches and low-lying swale tracts to make sure water runoff can be handled efficiently. “When that is done, we’ve got plenty more for it to work on, like sidewalk replacement and general repairs,” he said. Posted with permission from The Gradall Company, www.gradall.com. 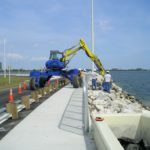 Brevard County, Florida, is one of the largest counties in the state – known mostly as home of the John F. Kennedy Space Center on the east coast and serious about maintaining its infrastructure with high-value equipment. 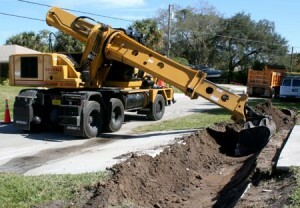 On a jobsite at Merritt Island in the county, the Public Works Department relied on just one piece of equipment to unearth and repair a water line beneath a street and then replace an outdated catch basin cover followed by loading dirt. 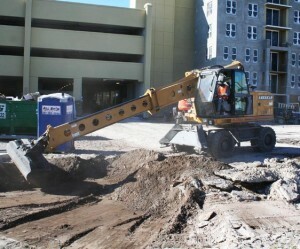 “We use it daily,” said operator James Aquino of the county’s XL 4100 IV excavator. That day, the Gradall was used to remove pavement and then dig down five and a half feet to determine the cause of a leak that had created a dip in the asphalt pavement. At the end of the workday, the Gradall boom was used to install steel covers over the hole for overnight safety. The next day, Aquino used the XL 4100 IV to remove the steel covers, refill the hole with limerock and then spread more fine aggregate material, creating a smooth grade with the delicate Gradall bucket movements. After compaction, a crew topped off the hole with asphalt. But that wasn’t the end of the workday for the Gradall. From the upperstructure cab, Aquino drove the machine several hundred yards down the street onto a grassy park area, around a guardrail and fence and into position to repair a catch basin cover. Never once leaving the operator cab, Aquino removed an old concrete cover over a c atch basin and replaced it with a new one, precisely positioning the huge concrete slab with the XL 4100 IV precise boom movements. “This machine is used for all kinds of jobs, like pulling out old sidewalk, removing trees, highway repairs and ditch cleaning,” said Aquino. “And lots of times, at the end of the day, we use it to load trucks with fill dirt to be used at different locations the next day.” Aquino, who has been operating Gradalls for about 10 years, said he is very pleased with the Series IV model. “With the automatic transmission, it’s much easier to get down the road from the equipment yard to wherever we need to work,” he said. “It’s also a lot more comfortable and easier to work with because it has more power.” Changing the mobility controls from the carrier cab to the upperstructure cab is also much easier than with earlier models, he said. “I like this one a lot, and I can get a lot more done with it on an average day,” he added. High efficiency work practices are critical for American Engineering Development Corp. of Hialeah Gardens, Florida – a major site development resource for general contractors and developers in South Florida. With over 400 employees and state-of-the-art equipment, American Engineering strives to complete large and complex jobs in the most efficient way possible. 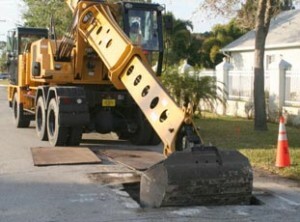 Maintaining infrastructure is an ongoing challenge for most municipalities and counties throughout the U.S. At Port St. Lucie, Florida, near the state’s east coast, the drainage division of the city’s public works department has an ongoing program to replace culverts in residential neighborhoods. Functional culverts are important for collecting and channeling storm water, but they can become ineffective if the pipes deteriorate or they become overgrown with vegetation. 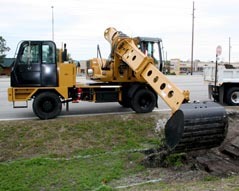 The city of Port St. Lucie uses an XL 4100 IV excavator for its culvert replacement project, which includes replacing steel pipes that were installed beneath concrete driveways up to 20 years ago. “The process starts with cutting concrete on the driveways,” said Bob Colson, crew leader for the drainage division. The XL 4100 IV removes the pavement and then carefully excavates dirt from around the culvert pipe before actually removing the pipe. “If the pipe is in good condition, we set it aside and re-install it later,” said Colson. “But a lot of them have rusted away and have to be replaced with aluminum.” The XL 4100 IV is used to clear out dirt to restore the proper grade before re-installng pipe and then spreading dirt and aggregate in preparation for a new concrete driveway section. “With the Gradall, we can replace three driveway culverts in a day, and also lay new lines between the culvert pipes under the driveways,” said Colson. 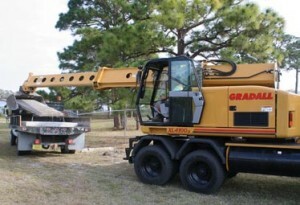 “Without the Gradall, we’d have to do it by hand and we couldn’t manage anything near that level of productivity in a day.” Arthur Agnew, who said he’s been operating Gradall excavators for nine or 10 years, said he really appreciates the automatic transmissions that are standard on Series IV models with highway speed undercarriages. He drives the XL 4100 IV from the equipment yard to work sites every day. “The new Series IV excavator is also a lot more powerful than the Series III models,” said Agnew, adding that he also appreciates how fast he can transfer mobility functions from the carrier cab to the upperstructure cab. Although there’s an in-cab switch to change the joystick configuration from Gradall to Deere or SAE, Agnew said he prefers the original manufacturer’s pattern. “That’s what I’ve always used, but I can see where it would come in handy with a new operator,” he said. Interstate highway projects can be among the most multifaceted construction projects. Some aspects of the work are highly visible. But other project elements are less dramatic and less often seen, including cutting drainage ditches alongside new pavement. And yet, proper drainage swale excavation and construction can be of key importance to the overall success of the project. In Fort Myers, Florida, Kiewit Southern Co. used a Gradall® Model XL 4200 to create important channels at a new interchange along I-75. 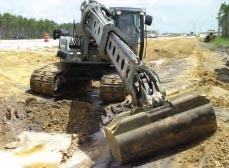 Outfitted with a 60-inch ditching bucket and its standard telescoping, tilting boom, the Model XL 4200 was used to efficiently cut contoured swale slopes, excavating to create flat channel bottoms and then create sloped sides to meet the plan specifications. The ditches run for about three-quarters of a mile along the entrance and exit ramps on both sides of a new Alico Rd. interchange. Ditches must have a 5-foot-wide flat bottom and sloped sides with a depth of one foot to one-and-a-half feet, depending on location. “We tried cutting the ditches with a trackhoe with a bar welded across the bucket teeth,” said Jonathan Farrar, Kiewit Southern’s grading superintendent. 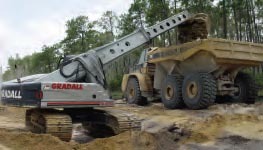 “You can do it that way, but the Gradall was able to do it a lot faster.” “It’s doing a good job,” added operator Don Blakley. Production ran several hundred yards per day, excavating material with the Model XL 4200 and then loading it into trucks where it was stockpiled for future use. 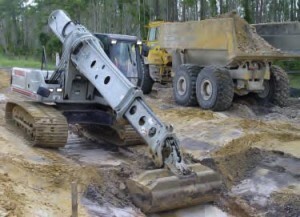 After shaping the ditches, the Gradall excavator’s tilting boom was used to efficiently line the ditch with a 6-inch lift of topsoil, after which it was seeded and mulched. © 2015 GS Equipment, Inc. All rights reserved. Receive our latest listings, special deals, and more!